Moving time: 3 hr 13 min. Weather: 55°F (13°C) in the morning; got up to 80°F (27°C) by the end of the ride at 10:30am. High today of 98°F Clear all day. This was a rather short, uneventful day. 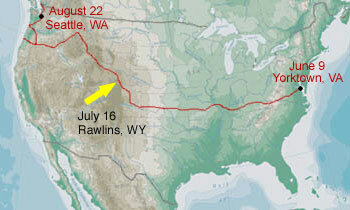 Towns continue to be few and far between, the weather is very hot, and we need some services here in Rawlins. Joe and I pulled into town at 10:00am after an easy ride from Saratoga. 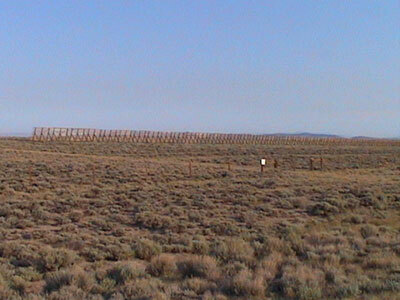 One unique feature of the landscape around here are these large snow fences. They stand about 12 feet (4 meters) tall and are constructed of wood. They are usually on the west or north side of the highway and sometimes extend for miles. Interstate 80 is a segment of the TransAm route for about fifteen miles. Most states prohibit bicycles and pedestrians from divided, limited access highways but they are permitted here in Wyoming. Joe and I were nervous about riding along the highway until we noticed that the stretch we were riding on was under construction. The westbound lanes were shut for bridge construction and resurfacing so we had both westbound lanes to ourselves. It was awesome riding! I felt so close to home since I-80 runs right past Lock Haven, Pennsylvania, my home town. I saw three eastbound riders today. There was a solo rider from Germany and two American riders. We met up with two other riders, Corrin and Travis, that we saw two days ago. They stayed with us in our hotel room. After taking pictures of beautiful landscape for weeks I decided to take a picture of an ugly oil refinery. 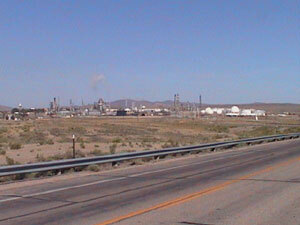 The Sinclair oil company is located in Sinclair, Wyoming. Sinclair service stations are very common here in the west and much of the oil is refined here. Joe and I got some business and entertainment taken care of in Rawlins since we got in early. The owner of Murry's Bike shop cleaned our chains for $3.00 each and I picked up some rim liners. We then went to the movies and saw Bourne Identity. It was an awesome movie starring Matt Damon. Joe has been itching to see a movie - not so much for the entertainment value as for want of a large, dark, cool, empty room. I have to agree with Joe, it was very refreshing to just sit down and chill for a while. We had dinner at a cheap mexican taco stand to fill the gut and saw Corrin and Travis at the Chinese restaurant by our hotel. We invited them to share the hotel room with us and split the cost. They went shopping at a discount store and bought a box of laundry soap that contained individual bricks of Tide laundry detergent. We split the detergent among the four of us and agreed that it was perfect for touring.